A while ago I gave my favourite childhood toy a bit of an analysis after losing faith in its severely gendered stereotype toys and, thankfully, found that it was slowly marching back in the right direction to becoming a unisex toy (read the previous blog post here). It will never hold the genderless uniqueness it had when I used to play with it as a kid, but by introducing new sets, minifigs and revising materials used in production Lego may actually become an inspiration to both children and the corporate world. When I last had a look, a new box set known as the ‘Research Institute’ was released containing an astronomer (complete with telescope and blackboard), a palaeontologist (complete with dinosaur skeleton, magnify glass and microscope) and a chemist (complete with flasks and a work table). The full female character range in this box set sold out almost immediately. The success of this could only mean one thing for lego. Create more female characters! 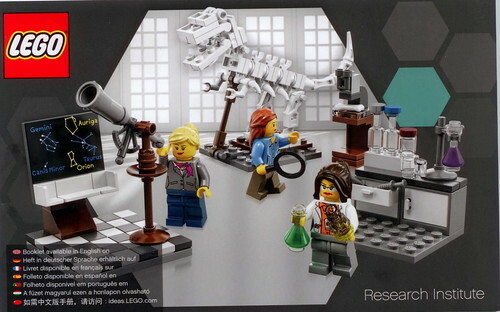 Lego is starting to break up the male dominated STEM disciplines (Science, Technology, Engineering and Maths) with new female minifigs. The new sets have female veterinarians, deep sea explorers, aerospace engineers, mechanics and pit crew members, including McLaren/Mercedes grease monkeys. What I find increasingly important in these new box sets is that they are mixed gender. Not only will these sets strip stereotypical gender roles from a girl’s eyes, but also, from a boy’s mind too. Personal favourite? The mechanic oozes awesomeness. She is cool, simple and looks like a normal girl with a love for gears. If you thought it was getting good, wait for the cherry on top. One of Lego’s newest releases is a Big Bang Theory box set with the whole crew. Yep, that’s right, they’ve got Penny, Bernadette and Amy as little lego figures too! I’m half tempted to buy it. Now, you can see where tackling gender stereotypes and encouraging young girls to consider STEM professions is inspirational for children, but how on earth are they inspiring the corporate world? As one of the biggest toy companies, it wouldn’t surprise me if they were ignoring the ever-increasing importance of sustainability, BUT, Lego has made me proud. Their bricks are made of ABS plastic which is highly dependant on petroleum for production. Oil is slowly becoming a rarer raw material so forward thinking companies are starting to find alternatives. They are pumping $150 million into the research of alternatives so that they will have found a new material for their bricks by 2030. Not only are they trying to achieve a more sustainable option, but they have terminated a long-term contract with Shell. Whether for selfish and/or practical reasons rather than a moral move to sustainability, Lego is leading by example on both its product range and on a manufacturing level. Fingers crossed that it will keep moving towards a brighter future with inspirational toys that can build confidence, creativity and a capacity to understand constructive concepts brick by brick.